From the summit of Uncompaghre Peak at 14,309 feet, the Rocky Mountain landscape stretches out in all directions in this morning panorama. 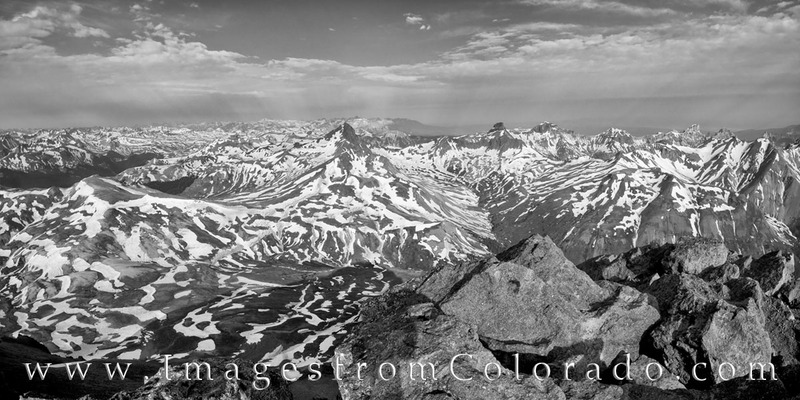 Distant peaks of 14ers and 13ers rise in the distance, making this black and white Colorado scene an amazing sight. We had departed our tents about 5:00am to make the trek through remaining snowfields and up the mountain to this point, and the payoff was well worth the effort. The views of the nearby 14ers and 13ers make this hike well worth the effot. This Colorado Image was taken about 8:00am on a July morning. We left out tents about 5:15am - just before sunrise. It was a relatively easy hike except for traversing up some snowfields. The landscape from 14,000 feet is absolutely amazing in this southern Colorado location. Photo © copyright by Rob Greebon.